Q: My hammerhead has a big chip in it. That shouldn’t happen, right? A: I haven’t seen a hammerhead chip in more than 30 years. Given some of the abuse dished out on construction sites and on volunteer workdays, all I can say is that today’s hammers are so abuse-tolerant, it takes a lot to chip one. Claw hammers are designed to hit nails, sets for sinking finish nails and specially made bars that are used to dig out nails or pry wood away from a surface. Don’t use them to strike hardened steel or to break up cast iron or concrete. Those jobs require a sledgehammer. Don’t use one hammer to strike another. 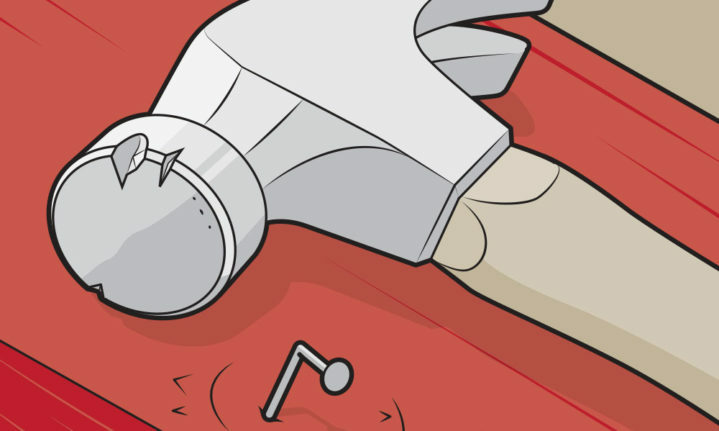 For example, don’t use a claw hammer to strike the head of another claw hammer in order to drive its claw deeper between two pieces of timber. Don’t use a claw hammer to hit a brick chisel, stone chisel, cold chisel, or centre punch. There are specific hammers to strike those. Don’t use a claw hammer (or its claw) to break or chip rocks or bricks. Regardless of the type of hammer you buy, get the best you can afford. I’ve owned hammers by Estwing, Vaughan, Warwood, Craftsman and Stiletto. They’re not cheap tools, but not one of them has chipped and I have decades of use on some of them.